Everybody who deals with development of website, service of some kind or other resources has experience with the beta stage of product development. This stage is quite essential as you have to test the product thoroughly before it gets to the end-user. To fix the majority of bugs and provide the use with functionality he expects the product to have. It time consuming and takes a lot of efforts. MagneticOne has come up with new service which is a salvation for those who go through beta stage often - BetaEasy. It was created to simplify this process. BetaEasy makes beta-testing process completely manageable in few minutes and allows you to concentrate on other important tasks and aspects of your product development. Sometimes the developers don't have good knowledge of what the end-user actually needs. They know only some of it and see the problem from their point of view. As a result the end-users get the product which misses the functionality they really need and is not quite what they expected. BetaEasy was created in order to make product development and launch more efficient and to guarantee that end-product meets customer's expectations. BetaEasy enables you to form the community of beta-testers who are going to test your product and leave their feedback concerning the bugs which should be fixed and the functionality that the product lacks. All feedback is collected in one place - it makes much handy for you to set the priorities e.g. to decide what bugs need to be fixed first. The users can vote for the bugs they consider most essential to be fixed. Thus the most urgent ones appear first on the list which gives you a great idea where to start. Benefits of BetaEasy are numerous. To name a few: collective solution of the problem. To great extent testers can find the solution to some of the problems they find themselves through public BetaEasy forums. This is pretty convenient as it saves time for you and your support staff as well as your money. 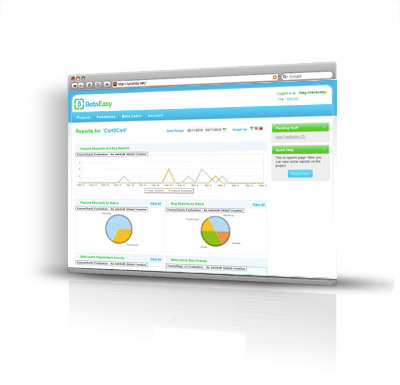 And, as I mentioned before, BetaEasy allows to collect all customers feedback at one place. To start using BetaEasy user has to sign up with the service for free. Than it's possible for him to choose whether he wants to use free account or select one of the paid ones to benefit from the extended functionality and additional features of the service. BetaEasy service is quite flexible and allows you to create various types of projects: public (tested by anyone who wants to), moderated (tested by group of beta-testers chosen by some criteria), private (managers or owners of the project invite the beta-testers ). This beta management service makes it quite convenient to organize beta-testers and feedback. White Label makes it possible for you to make BetaEasy look so that it fits your corporate identity. Another great advantage of this service is that it gives the opportunity of API Access. Which means you can easily integrate BetaEasy with any product and react to the events in BetaEasy promptly and reflect them in the tested system or product. This makes it very handy for you to receive the information from BetaEasy such as: list of beta-testers, bugs, confirmed bugs, etc. BetaEasy is brand-new online feedback management service, which can be easily integrated with any website, service, any software regardless of e-commerce platform or programming language. This service will make beta stage of your product development much easier and completely manageable. Your customers will always get properly tested, high-quality product and you will save time and money for something else.